Legible Prescriptions. Generic Prescriptions. Rational Prescriptions. These are the new guidance mantras that medical practitioners need to keep in mind while writing their prescriptions. The Medical Council of India, stressing on the importance of legibility of prescriptions came out with an official gazette notification asking the doctors to keep cleanliness on paper. Medical Dialogues team had earlier reported that in the month of July, the Health ministry had approved to amend Indian Medical Council Regulations, 2002, to incorporate the above changes. The move is directed to reduce prescription errors as well as bring uniformity in prescription. As there are number of brands providing the same drug salt specification, patients would now have the freedom to choose a brand of their choice. 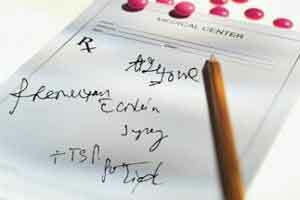 Moreover, writing in capital letters would alleviate the problem of misinterpretation and hence wrong medications. Many a times chemists are caught with fake and duplicate medicines which government and MCI could never prevent.This decision is like that terrorists are given the charge of security of country. Public ki jabe katwane ka ek aur rule.Pharmacists are not available at most of the chemists shops.Now illiterate people will decide the brand who are not at all concerned with recovery of patient.Who are only concerned with the brand which is giving him more profit.All doctors are also careful about costeffectiveness of the drug brand,not to talk of corporate hospitals where nonmedical administrators or owners most of which are businessman or political leaders decide the brand availability not the doctors. Absurd now the choice of brand goes to chemist who knows nothing instead of this the mci could have banned sale of branded drugs. What about low std drugs who will have to face responsibility mci/ doc/ chemist . In that case why does the government allow to market products with brand names? must do so ONLY in generic names .